PURETEA Black Line Rooibos 25 builtjes. 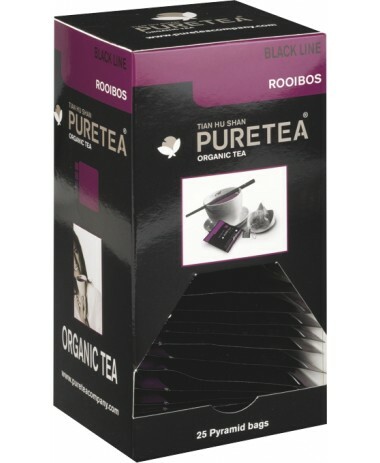 Rooibos is een smaakvolle Zuid-Afrikaanse Rode thee. 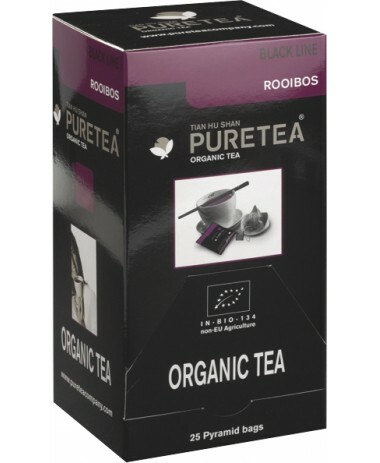 Rooibos thee werd populair gedurende de Tweede Wereld Oorlog toen de theeleveranciers uit Azië theedrinkers dwongen om enkele alternatieve theesoorten te gaan drinken. Rooibos is een smaakvolle Zuid-Afrikaanse Rode thee. 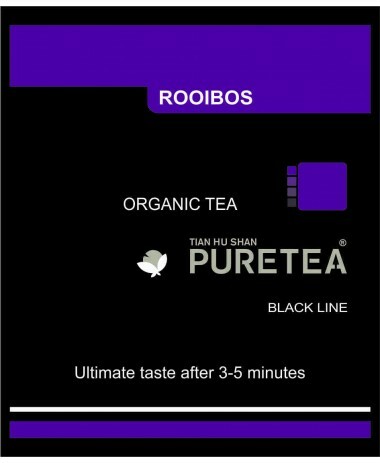 Rooibos thee werd populair gedurende de Tweede Wereld Oorlog toen de theeleveranciers uit Azië theedrinkers dwongen om enkele alternatieve theesoorten te gaan drinken. Door vele wonderbaarlijke genezingen en in vele smaken te krijgen is Rooibos thee geen alternatieve thee meer, maar een echt theesoort die onder echte theedrinkers niet meer is weg te denken. Pure Tea presents you a complete new tea product. Trendy, pure and authentic. 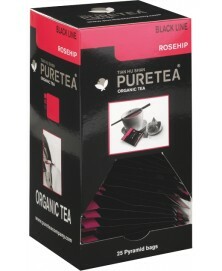 The taste, the aroma, the colourful tea-leafs and the extraordinary shape of the teabag make drinking tea a true experience. Surprising sorts of tea, 100 % biological, compiled from the superior first picking: the finest tea-leafs of the season, picked by hand and of the best quality. The Pure Tea plantation is situated in the south-western part if India on an imposing mountain. This part of India experiences high precipitation, during the monsoon period as much as 250-300 mm of rain per day. The daytime temperature can rise to about 40°C, creating greenhouse-like conditions of extreme humidity and heat. This tropical climate contributes to the unique malty taste, a feature for which our tea is well known. 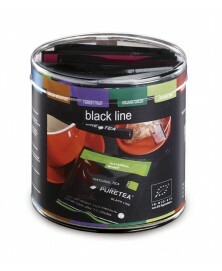 The Black Line offers the same high-quality tea as the White Line in a different packaging concept. 11 different flavours, individually packaged. Apart from seven familiar flavours from the White Line, the Black Line features three new flavours: Rooibos Vanilla, Honey Caramel and Earl White Strawberry. The practical packaging gives the Black Line an attractive appearance. The matching PureTea box provides an extra inviting presentation.